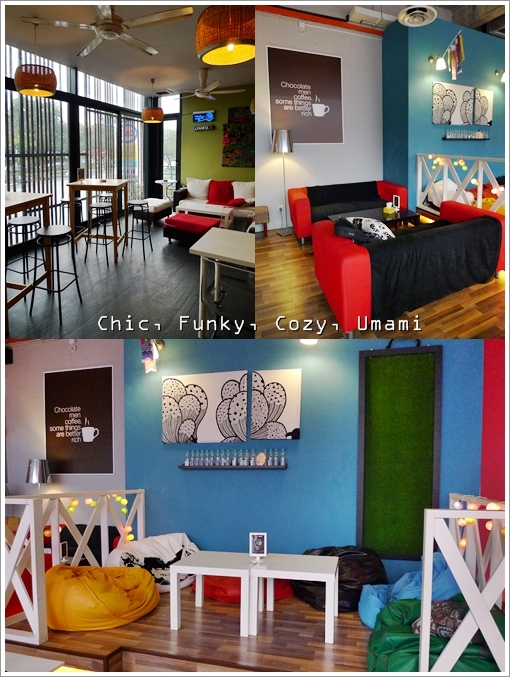 Burst of colours filling every nook and corner of Umami Cafe. 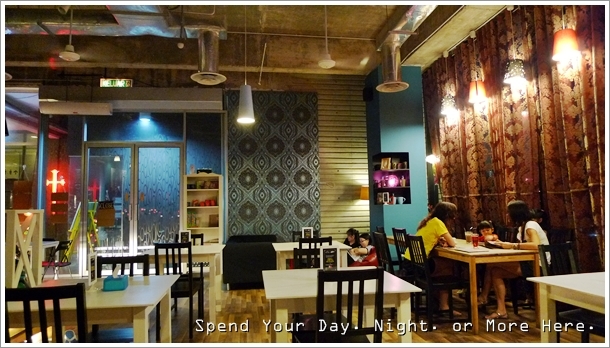 The bean bags, the plush couches, the knee level tables, the ornaments and paintings adorning the bright walls, and the free WiFi service. Almost too cozy to be of commercial value. Kepong’s a territory uncharted. At least to this clueless soul writing his thoughts down now. I was having this impression that Kepong’s somewhere near to Puchong (probably because they rhyme?). Yeah, that’s not very clever of me, I know. I once visited Kepong; or rather, blindly trudged along the streets of Kepong when work took me to Taman Bukit Maluri. And I ended up at Tuck Kee. Fast forward almost 3 years later, and a return to this stranger of a town was imminent. Umami Cafe‘s a relatively spanking new cafe in the heart of Kepong town; in Bandar Menjalara to be exact. I did not expect such a structure of architectural brilliance (comparatively speaking, when you’re accustomed to the older structures around Kepong) to be built surrounded by not one, not two, but THREE petrol stations. K Gallery’s the name of the commercial unit, and Umami Cafe’s situated on the first floor above Old Town White Coffee, Moe de Cafe (an anime-themed fancy cafe with waitresses dressed in the most absurd pieces) and this German watering hole named Deustche Gasthaus. 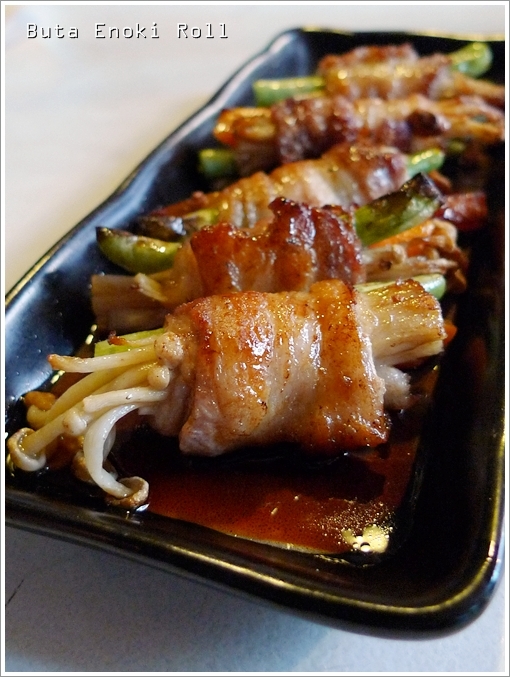 Buta Enoki Rolls (RM9.90/USD3.30) – An almost flawless combination; enoki mushroom and long beans wrapped in juicy pieces of bacon and grilled, served with yakiniku sauce. Barely half a year in operation, and Umami Cafe has already attracted a steady legion of fans. From all walks of life, especially students and the younger generation dropping in and cashing in on the cleverly designed layout, fully air-conditioned seating area, elevated floorboards with plush bean bags and low tables perfect for a tete-a-tete session, and even a designated and enclosed smoking area. How thoughtful. 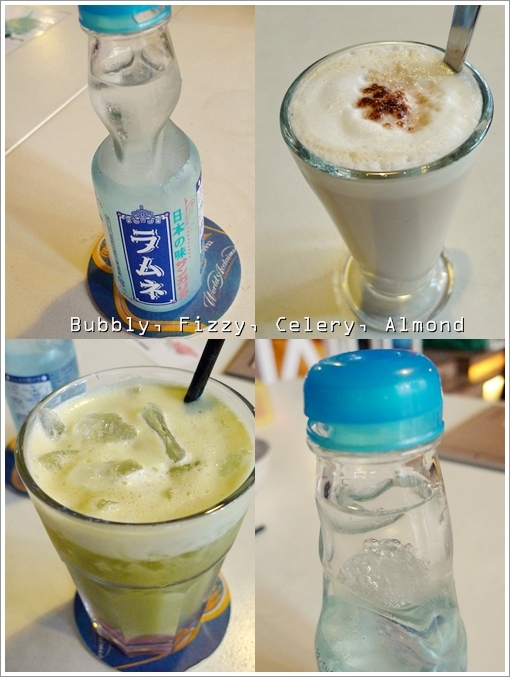 Go for the (top left) Ramune (RM7.50/USD2.50); a fizzy creation of a soda drink imported from Japan. Notice the bubbly ball within the neck of the bottle? That’s how the drink got it’s fizzle. Katsu Don (RM13.90/USD4.60) – Bread-crumbed fillet of boneless pork with battered egg omelette and a sweetish tonkatsu sauce on white rice. Buta Kakunimen (RM13.90/USD4.60) – Ramen’s their signature here at Umami; a befitting name for the bowl of hot noodles in a savoury broth. Served with half of a hard-boiled egg, chopped scallions and chunks (more than slices, really) of braised pork belly (what we call 3-layered pork). 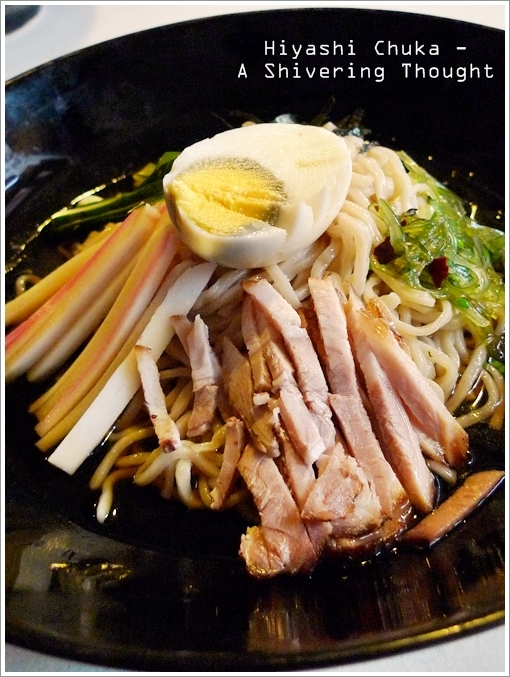 Hiyashi Chuka (RM12.90/USD4.30) – Cold self-made noodles tossed with several ingredients; thinly sliced pork, marinated seaweed, crabsticks and hard-boiled egg. Being a cafe specializing in Japanese cuisine, this place reminded me of Kissaten the first glimpse. A cafe on the first floor, with painstakingly designed ambience, menu featuring not only light bites but full individualized portions of rice/noodles, and lots of pork in the dishes. Yes, as NON-halal as this can get. Everything we were served with that evening featured pork in a predominant manner. 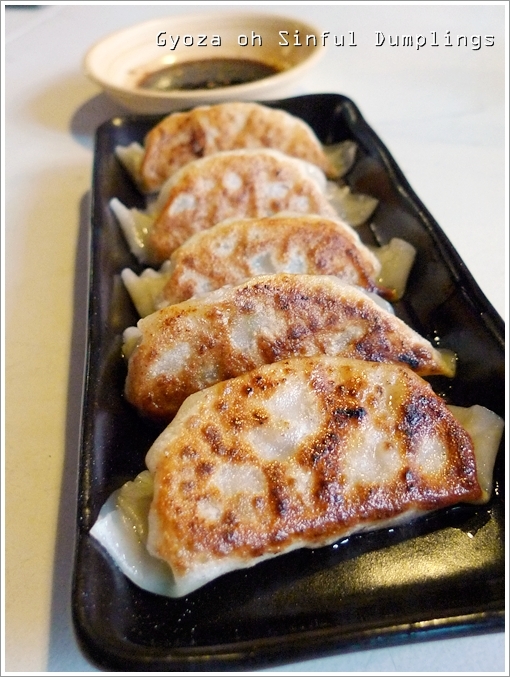 Down to the snacks of gyoza or dumplings pan-fried and served with a vinegared soy sauce on the side. Needless to say, the bacon-wrapped enoki mushrooms got our stamps of approval, as crunchy and juicy enoki paired with smoky bacon complements each other to a tee. The noodles and rice were of substantial portions. The cold noodles (Hiyashi Chuka) being the most interesting of the lot; combining their very own fresh made noodles (with the obvious omission of lye water, thankfully) with strips of lean pork, and julienned vegetables in an appetizing tangy vinegar sauce. Seemingly, students come for homework, revision, or just plain getaway from the mundane environment of home. Talk about an alternative to library nowadays? 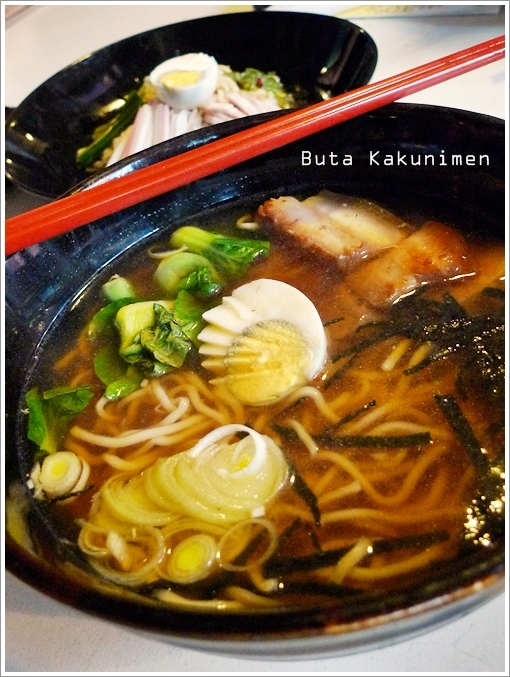 The Buta Kakuniramen though could do with tampered saltiness in the soup. Slightly too salty to register itself in our memories. However, the chunks of fatty pork belly were much relished. By yours truly, more than the others. They also serve the thin slices of Cha Shu (Japanese style of barbecued pork served with ramen), either separate as starters or together with the noodles. Guess that has to wait for the next visit. On the whole, it was evident how much effort and energy the proprietors have put into this brainchild of theirs. The chef once worked cooking for Japanese expats from the industry somewhere in Shah Alam, for a good many years I was informed. Hence there lies the experience in whipping up real food rather than paltry cafe bygones. 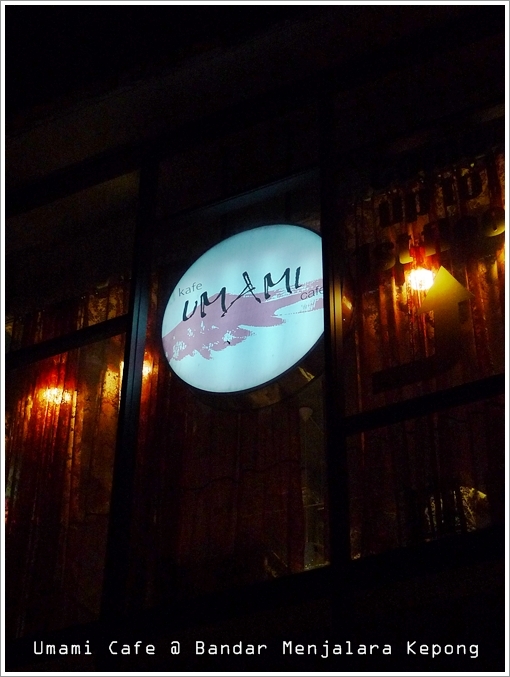 Umami Cafe – Inconspicuously parked on the upper floor. Fri-Sat : 11am-2am, Sun : 11am-12am. Telephone : 6012-690 8000, 6012-664 0526. *Thanks to Carrie for the invitation, and Jerry/Jas for the hospitality. And the elaborate recommendations on food in Kepong, and KL in general. That should keep me busy for weeks. Or months. Come and visit us !!! Nice and cozy and thumbs up hospitality cos the boss is very strict in customer service ! Nice interior and food looks good! Haha … on the contrary. The day after was spent mostly in bed. Sunday ma …. Just notice about this cafe today,really surprising me that I’m not even the presence of it coz it’s at my neighborhood Going to try it out soon! Sure. This is right above Old Town, and the German place with pork and beer. 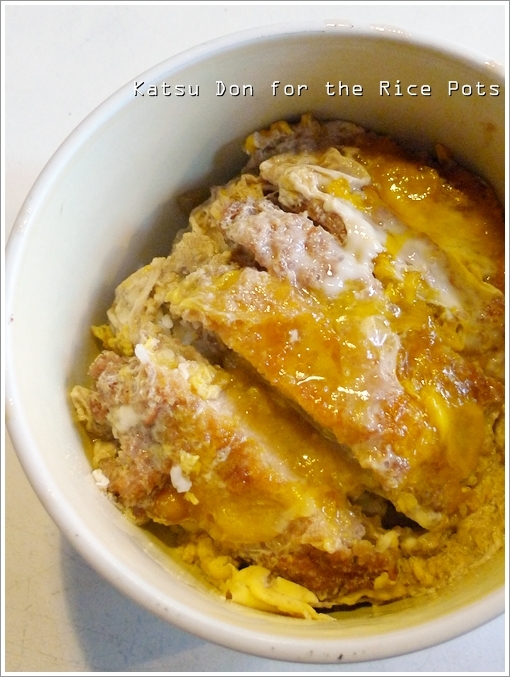 ooo the katsu don looks nice with the egg yolk ‘melting down’ on the meat. eyeing on the Buta Enoki! slurp. Haha..yeah, indeed a little far off. Wait, aren’t you somewhere in KL? i have never been to kepong before although im from KL 🙁 maybe i shud go there too someday.. I am in PJ and I have made my way there. You should too. Seemingly, there are a few good steamboat restaurants and dai chow stalls there. Be sure to back again! With my camera, of course. Thank you for coming to visit us! Looking forward for you guys to drop by and tryout! Yea is a nice place to hang out. Went there quite a lot of time and had great fun there..
Thans Alien for the correction. U r welcome XD..Actually I was the one who post the location to google map..muahahaha.. So when I saw ur maps to umami cafe I went inside and see whether is the one I uploaded or not..
why no LIKES button? haha LIKES ALien’s comment! Haha this is not facebook XD..thanks for the like anyway..
Do you there still hiring people? ?????????????????????????????? ?, ?????? ?KUIL BUDDHA SAMNAK SAMBODHI(Thai) No: 19 Jalan 38 Taman Desa Jaya, Kepong, Kuala Lumpur, Malaysia.??????????? ?, ????? ?, ????? ?, ??? ?, ????? ?, ??? ?, ??? ?, ???????. ??? ?, ??? ?, ???? ?, ???,?????. ????????? ?, ???? ?, ?????? ?, ???? ?, ??????????? ?, ?????????. My daddy also loved the subjects brought out in this article. Please continue writing such helpful information, I adore this sort of issues!